Many of us know that Hydraulic Crane is a Device which is used in engineering plant to lift the Heavy Loads for shifting purpose. These Cranes have different types of Working Principle and Driving Media. You can operate Crane by Electric Power or Water also. Electric Driven Cranes are used in Manufacturing Plants whereas Hydraulic Cranes are widely used on Dock Siding, Warehouse or Big Workshops. 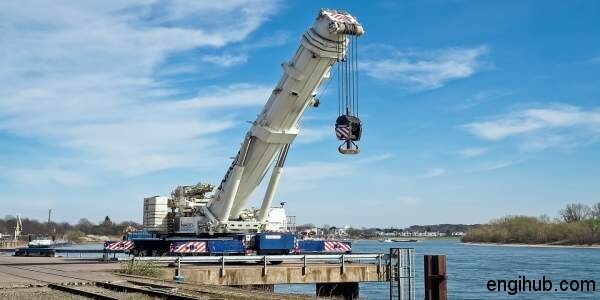 A Hydraulic Crane can lift a heavy load up to 250 Ton in weight. In this post, I will cover the details about Hydraulic Crane. A Hydraulic Crane in its simplest form consists of a Vertical Post, Tie and Jib having Guiding Pulleys. Hence all these parts are the basic requirement of a Hydraulic Crane. Jigger is provided near the foot of Vertical Crane Post. The Jigger consists of a fixed Cylinder, having a Pulley Block and containing a Sliding Ram. One end of the Ram is in contact with Water and other carries a Pulley Block. A Chain or Wire Rope, one end of which is fixed, is taken round all the Pulleys of the two Blocks, through the Vertical Post and finally over the Guide Pulleys. A Hook is attached to the other end of the Rope for handling the Load. There is a pipe connection for supplying water under High Pressure to the fixed Cylinder of the Jigger. The Load to be lifted is suspended on the free end of the Wire Rope. Hence The Water, under High Pressure, is admitted into the Cylinder of Jigger. This Water, Forces the Sliding Ram to move towards the left. This outward movement of the Sliding Ram makes the Pulley Block move outwards. Due to the increased distance between the two Pulley Blocks, the Wire Rope is pulled and the load is lifted up. If the load is required to be shifted, the Vertical Post, of the Hydraulic Crane, can be rotated through the desired Horizontal Angle also. I hope, now you understand the working of Hydraulic Crane.